Jesus supposedly did it in three days. It’s taken quite a bit longer, however, for the St. Nicholas Greek Orthodox Church to find its way back to life. The church was destroyed in the 9/11 attacks, but a vote today could finally provide it with a new home. St. Nick’s has reached a tentative agreement with the Port Authority to rebuild at the corner of Liberty and Greenwich streets — about a block west of its original location at 155 Liberty. 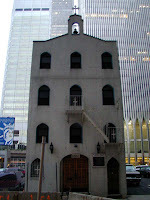 The deal has been held up for quite some time, which has in turn held up progress on the renovation of Ground Zero, with the Port Authority claiming that it’s been unable to work on part of the foundation for the site, as well as finalize security plans, until the fate of the church is figured out. $20 million of the budget for the church’s reconstruction will be split evenly between JPMorgan Chase and the bistate agency. The Port Authority’s board of directors meets later this morning for the vote.